Article originally appeared on Georgia Restaurant Association. The winners of the 2017 Georgia Restaurant Association Crystal of Excellence (GRACE) Awards were announced this week in Atlanta. The GRACE Awards Gala is the Georgia Restaurant Association’s (GRA) annual black-tie gala event honoring Georgia’s restaurant industry. Jim Stacy, host of the Cooking Channel&apos;s “Offbeat Eats,” served as the Master of Ceremonies and Little Country Giants provided live musical entertainment. The GRACE Awards are peer-nominated and winners are selected by the GRACE Academy, made up of past honorees. GRACE winners are presented with crystal works of art created by renowned local artist Hans Godo Frabel. A portion of the proceeds from this event goes to the Atlanta Community Food Bank. At a young age, John Ferrell realized he wanted to be the same type of host as his Aunt Frankie, providing people with a taste of the South and a warm welcome. After going to Florida State University and the Dedman School of Hospitality, John moved to Atlanta and worked at several restaurants in management. In 1994, John&apos;s dream of becoming the ultimate Southern host came true, when Margaret Lupo hand-picked him to take over Atlanta’s beloved Mary Mac&apos;s Tea Room. Over the last 23 years at Mary Mac&apos;s, John has seen its popularity rise to all-time highs, averaging 2,000 diners a day. John attributes this success to his love of people and his commitment to providing them with outstanding customer service and time-tested traditional Southern recipes. As the largest North American distributor of food products, Sysco was one of the first members of the GRA. The company continuously collaborates with the restaurant industry in order to contribute to Georgia’s prosperity. Sysco also provides financial, strategic and leadership support by sponsoring events such as the GRACE Awards Gala, the GRA Golf Tournament and the GRA Chairman’s Reception. As an active member in the community, Sysco partners with industry groups that focus their efforts on promoting the hospitality industry, such as the Atlanta Community Food Bank, The Giving Kitchen and the GRA. Their dedication to the industry ensures that people will continue to come together to dine out and take pride in the culinary expertise found in this state. A native of Atlanta, Tom Murphy got his start in hospitality at 12 years old as a hot dog vendor and eventually opened his own cheese shop at 18. He graduated from Georgia State University, where one of his class projects was to develop a business plan. That plan grew to be one of Atlanta’s most treasured restaurants, Murphy’s, which Tom opened at the age of 21 in 1980. Since then, Tom has opened two more restaurants in the Atlanta area – Paces & Vine and Morningside Kitchen. In 2005, Tom founded Good Measure Meals, a meal delivery service that benefits Atlanta’s less fortunate. The program now functions as a social enterprise for the non-profit group Open Hand Atlanta. Steven Satterfield, executive chef and co-owner of Miller Union, was a James Beard Award finalist for Best Chef: Southeast in 2013, 2014, 2015, 2016 and won the coveted award in 2017. He has also been featured in numerous publications, is a cookbook author and serves as a leader of several local culinary organizations. He is dedicated to cooking seasonally and supporting local farmers. General manager and co-owner Neal McCarthy leads the dining room at Miller Union with a commitment to excellent service. A certified sommelier, Neal selects wines from small producers who focus on biodynamic and organic practices. Miller Union was named a semifinalist in 2015 and 2016, and finalist in 2017 for “Outstanding Wine Program” by the James Beard Foundation. Jonathan “Bob” Ewing and Jon Joiner started their restaurant careers as dishwashers and ascended through the ranks to cook, server, bartender, and manager. In 2009, they bought into a concept they believed in - the Amici franchise. 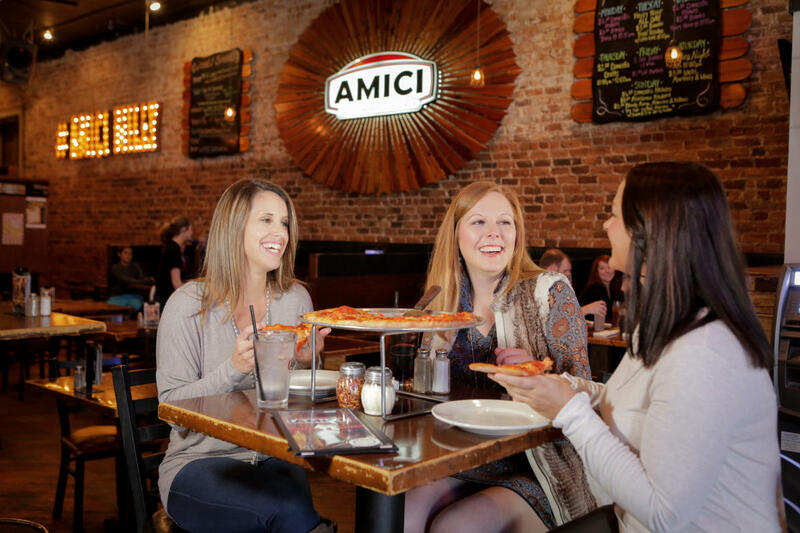 They beat the odds of a recessive economy and have taken Amici to the next level, now owning and operating three successful locations in Milledgeville, Lake Oconee, and Macon. Jonathan and Jon are committed to developing lasting community relationships, not only with Amici patrons but also their employees. They try their best to create a memorable work environment that makes a positive impact on people, no matter where they end up. Founded by media entrepreneur, environmentalist and philanthropist Ted Turner and celebrated restaurateur George McKerrow, Ted&apos;s Montana Grill is celebrating 15 years of serving time-honored American cuisine, upholding a commitment to sustainability and turning guests into friends. In addition to creating memorable dining experiences through genuine hospitality, Ted&apos;s offers its customers the largest bison menu in the world, locally sourced natural foods and made-from-scratch desserts. Ted&apos;s serves thousands of people each day in 17 states, including 13 locations across Georgia. After Brandi Johnson’s first solo culinary competition, she took home the third place title and a newly discovered passion for culinary arts. She then joined her school’s culinary team, who placed first at region and went on to place second at the state level. She was also part of her high school’s Georgia ProStart competition team, who received first place at their state competition and continued to nationals. Brandi is doing work-based learning at her high school with her culinary teacher and has dreams of a career in the industry. Having worked in restaurants for 30 years, Ronald Foster is a hospitality veteran. He started out at Denny&apos;s, then worked at Holiday Inn, and now has been with Concessions International for 22 years. He is successful in his role as customer service ambassador for Fresh To Order at Hartsfield-Jackson International Airport, making people smile all day long. Ronald understands that having a positive attitude and being grateful for your job goes a long way with guests. Andy Palermo&apos;s journey in the industry began when he was 16. As a bus boy at a small Italian spot near his home, he learned the value of hard work and the true meaning of hospitality. He has carried these values into his career in management at El Felix and Superica, where he finds joy in fostering an environment of growth and providing opportunity for other people. Andy knows that no matter how small a gesture of hospitality might be, it makes a positive impact on the world. education and awareness. The GRA is sanctioned by the National Restaurant Association to operate Georgia’s only not-for-profit representing the state’s foodservice industry. The GRA serves as the unified voice for over 17,900 foodservice and drinking places in the state of Georgia with total sales in excess of $19 billion which provides more than 446,600 jobs. From large chains to start-ups, the GRA helps make Georgia a better place for restaurants to do business and helps make restaurants better for Georgia. The GRACE Awards is the Georgia Restaurant Association’s annual black-tie gala event honoring Georgia’s restaurant industry. The GRACE Awards finalists are peer-nominated and honor the top performers in the following categories: Lifetime Achievement Award, Industry Partner of the Year, Distinguished Service Award, Restaurateur of the Year, ProStart Student of the Year, Restaurant Employee of the Year, and Manager of the Year. The winners are announced at the event and are presented with crystal works of art created by renowned local artist Hans Godo Frabel. A portion of the proceeds from this event benefit the Atlanta Community Food Bank, whose mission is to fight hunger by engaging, educating and empowering the community.